1992. After graduating, Gary secured an internship and residency in small animal surgery at a private practice specialty hospital. During this training, he enjoyed helping teach interns, which in turn led him to become a professor at Mount San Antonio College in 1999. Gary is still teaching there, leading future Registered Veterinary Technicians in the journey to becoming licensed. He’s passionate about veterinary medicine, and his goal is to educate Veterinary Technicians to allow them to successfully pass their state board licensing examination and to give them the practical and technical skills needed to succeed in practice. 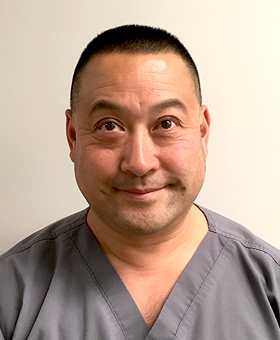 During his surgical training, Gary’s interests in medicine gradually changed to emergency medicine and critical care with an emphasis on emergency surgery, and that has been his focus ever since. Gary’s love of animals extends into his home, as he has a farm of rescue animals from dogs, cats, horses, chickens, and goats that all seem to have different medical problems. Outside of work, Gary enjoys outdoor sports with his family. His favorites include motocross, hiking, camping, fishing, and wakeboarding! Click on image to download Dr. Gary Jon Uyeno’s Bio.